Dated Feb. 19, 1943, but it’s obviously misdated; it’s in an envelope postmarked Feb. 26, 1944. 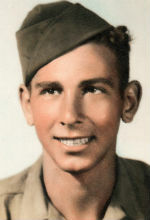 He was officially inducted into the army on Feb. 19, 1943, and wrote his first card home nine days later. I received three letters from you all dated Jan. 22, Jan. 22 and Jan. 27 and I was happy to hear from you. I received the three clippings you sent, but the third one is definitely not about me. If you will only think of what an army is composed of, you will see that it it is almost impossible for me to find anyone in the same army as I am in. When you speak of my outfit, you mean the same regiment that I am in. I sure was happy to read that clipping about Vince and I hope he stays there for the duration. I was also happy to hear that the two Joes are here in Italy and I sure do wish I could meet up with them. If they write to me and tell me what they are doing, I’d know right way where they were. Especially Joe Acquista. If he wrote to me, I might have a chance to visit him. Taking another look at that picture you thought was me, that guy isn’t even in the American army. I am still sweating out those other packages you said were on the way. I would like to get hold of the pipe. I have yet to see someone from home over here. I don’t even know where they are. You say there are plenty of them over here, but if you don’t say where, for instance, what division or repl. depot, I’ll never find them. I can’t take off and go riding all over the country looking for someone when I don’t know or even have an idea where they are. I just received another two V-mails from you all dated Feb. 4, which is pretty good service. Well, that’s about all for now so I’ll close. Give my love to Uncle Dave, Aunt Mary, Gevena, Genaro, Grandma and Grandpop. Let me know how long it takes for my letters to get home.